Thus began a year-long project in which Ellis, with encouragement and scholarly advice from Ladin, prepared a closely argued essay on A little East of Jordan: Human-Divine Encounter in Dickinson and the Hebrew Bible. The paper was published in the Spring 1999 issue of The Emily Dickinson Journal. The Journals editor is Dickinson scholar Suzanne Juhasz of the University of Colorado at Boulder. 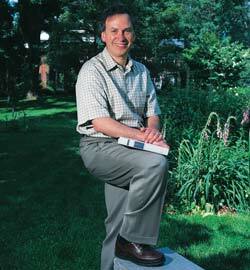 Professor Juhasz found the essay brilliant, and praised its genuine insight in the fields of Dickinson studies and Biblical scholarship. This is, of course, an astonishing endorsement  not because Juhasz recognized the merit of Elliss analysis, but because the informal norms of the Academy tend to keep scholars working within their own disciplines. As a rule, mathematicians do not write scholarly critiques of poetry and the Bible. One must be very clear about this point: Though it would tickle the fancy of many a Dickinson fan if he did so, Ellis never asserts that the poet knew or was familiar with Hebrew. in the gardens of Emily Dickinsons Homestead. Devout New England Congregationalists of Dickinsons day believed that the Bible was written in an authoritative and transparent language faithfully mirroring spiritual reality. In other words, it was thought to contain  literally and essentially  The Truth of God. Though, as many scholars have argued, the Bible shaped Dickinsons universe, from an early age she displayed rare independence in her religious life (for example, her refusal as a teenager to be saved along with her fellow students at a religious revival at Mount Holyoke Female Seminary). Consider that in its original format the Torah is a handwritten scroll containing only consonants but no vowels or punctuation. The reader is thus empowered and urged to experiment with alternate vocalizations and punctuations and thereby discover new meanings in the text. Learned Hebrew scholars hold that wordplay is the trace of Gods breath in the text. Through wordplay, the reader becomes Gods partner. This is, by any measure, a startling recasting of the familiar Bible story, as Ellis demonstrates. The poet is ironic, humorous, audacious, even outrageous. What an idea to imagine an Angel asking of a mere human permission to eat breakfast! Ellis believes that Dickinson made Jacob a Gymnast to highlight her discovery of a new facet of Gods personality that is revealed in the encounter at Peniel  and that facet has to do with dynamism, intimacy, dance, struggle and play. The word Gymnast suggests the acrobatic, paradoxical flipping of perspective that is a key theme in the poem. The gymnastic Jacob of Dickinsons creation tumbles between human and angelic realms. In her tight focus on the wrestling match, she offers the reader an utterly radical view of the human/Divine relationship  a view that proposes a reversal in the traditional top-down hierarchy between God and humankind, and even holds out the possibility of intimacy. Thus, and in numerous other ways Ellis cogently lays out in his essay, Dickinson brilliantly dealt with the problem of imagining the unimaginable: meeting up with God. Still the question nags: Might not this unusually well-educated 19th-century woman, surrounded by learned clergymen and steeped in religious culture, have known Hebrew? Who would be so foolish as to argue that point? This summer, by invitation, Ellis read his paper at the annual meeting of the Emily Dickinson International Society  a heady and unusual opportunity for a scholar of higher mathematics. Though he doesnt like to push the analogy too far, Ellis sees a rich connection between mathematics and poetry, especially Dickinsons. Its a matter of reading technically specialized, difficult language. Of meticulously analyzing, element by element. In preparing his essay on A little East of Jordan, Ellis feels he served an apprenticeship of sorts. The essay went through 13 drafts, and cites dozens of literary sources. Nor will this be his only piece of Dickinson scholarship. There are at least a half-dozen other Dickinson poems based on key figures in the Hebrew Bible  Abraham, Moses, and Elijah among them. Having honed his analytical skills on Jacob, Ellis plans to tackle another of the Biblical poems before long  that is, when he is not engaged in his new research project, which is one of the important, outstanding problems of mathematical physics: investigating applications of large deviations to models of turbulence.